Mira Grant, author of the Newsflesh series that began with Feed, is back with a new biotech horror series. 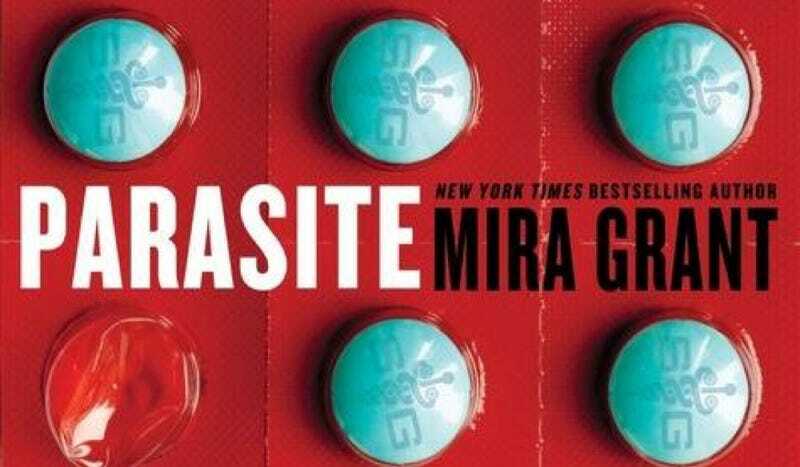 Parasite, the first novel, comes out this month — and it's an incredible, disturbingly plausible tale of what happens to a world where medical treatments have minds of their own. We owe our good health to a humble parasite - a genetically engineered tapeworm developed by the pioneering SymboGen Corporation. When implanted, the Intestinal Bodyguard worm protects us from illness, boosts our immune system - even secretes designer drugs. It's been successful beyond the scientists' wildest dreams. Now, years on, almost every human being has a SymboGen tapeworm living within them. The Embarcadero encompasses a series of grassy lawns and jogging paths along the San Francisco Bay. It’s one of the most scenic places in an already beautiful city, and even on a workday afternoon, it was decently crowded with a mix of tourists and natives. The sky was a flawless blue, the color of surgical gloves, which probably had something to do with the size of the crowd. There’s something about a beautiful day that just encourages trips to the seaside, even when the seaside is only a few blocks from your office. Maybe especially when the seaside is something you can see from your window while you’re pretending to care about work. Nathan and I walked along a stretch of grass near the street, close enough to each other that we didn’t feel like we were in danger of getting separated by random joggers, far enough apart that we could enjoy the day on our own terms. Nathan liked to look at the ground as he walked, watching for interesting plants and examples of the increasingly rare local wildlife. I preferred looking at the sky. Somehow, the endless blueness of it all never stopped amazing me. “Time and insurance are cruel masters,” I said automatically. I still couldn’t take my eyes off the dog. The jogger had stopped and was scolding his pet now, although they were too far away for me to hear what he was saying. The dog pulled harder on her leash, and barked, once. That sound was loud enough to carry, and several other heads turned toward it. Dogs barking in the city wasn’t anything unusual. Dogs barking in that much evident distress was. Maybe we weren’t the first ones to witness what happened next; maybe other people saw it happen before we did. But those people didn’t tell anyone what they’d seen—maybe didn’t understand what they’d seen—and we did. That made all the difference in the world. First the jogger dropped the leash. It fell to the grass, and the dog ran several yards before turning back to face her master, barking again. She was a good dog. I could tell she was a good dog, even without knowing her name or why she was so unhappy. A bad dog would have run as soon as she had the chance. This dog looked back to her master, waiting for whatever was wrong to go away and leave things the way they were supposed to be. I abandoned all thoughts of a dognapping when I saw the look the dog was giving to that man, to her man, as she waited for things to fix themselves. The man didn’t move. For several seconds, he didn’t move at all. Then all the tension went out of his shoulders and neck, leaving his head to loll limply forward. Several more seconds passed. Nathan’s hand tightened on my shoulder. The dog immediately started barking again, her ears going flat against her head and her posture going rigid, something I recognized from the shelter as a sign that she was about to attack. Without thinking about it, I put two fingers in my mouth and whistled. Her head whipped around, ears going back up, and she broke into a sudden run, heading straight for us. “Oh, crap, she’s going to attack!” said Nathan, and pulled me backward, seeming set on physically removing me from the scene if that was what it took to keep me from getting savaged. I pulled my shoulder out of his grasp. “No, she’s not,” I said, and dropped into a crouch just as the dog reached us. She practically flung herself into my arms, whining frantically. She stank of urine, a hot, acrid smell. At some point during the confrontation with her master, she must have pissed herself. “What did he do to you?” I muttered, and raised my head, intending to give the dog’s owner a piece of my mind. Then I froze, arms tightening around the still-whimpering dog. She plastered herself hard against me, like she thought she could somehow protect us both by cowering just a little more thoroughly. The man—her master—was walking toward us with his arms held out for balance, a blank look on his utterly slack face. He looked like the people Joyce and I had seen at the mall; he looked like he was sleepwalking. All around us, people were shouting and pointing at him. Many of them were filming his shambling approach with their phones. The footage would be all over the Internet before the news crews even showed up. This time, when Nathan pulled on my shoulder, I didn’t pull away. Instead, I scrambled to my feet, grabbing the dog’s leash at the same time. She whined, but she came willingly as the three of us turned and ran, as fast as we could, away from the Embarcadero. We arrived back at the hospital winded and sweaty, having run the first two blocks and walked the rest. Only the dog seemed unaffected, probably because she belonged to a jogger—keeping up with me and Nathan had to seem like a walk in the park to her. Just thinking the word “park” made that uneasy feeling in my gut reappear. I staggered to a stop just inside the lobby, catching myself against the wall with my free hand as I gasped for air. The dog sat down by my feet, assuming the patient waiting posture that has been the characteristic of the Labrador retriever since the breed was born. The dog—Beverly—looked up at me with warm, trusting brown eyes. I was a human. I had her leash, and I knew her name. Clearly, I was going to make everything okay. It must be nice to be a dog. “Right now, I’m not going anywhere that isn’t in this hospital, and neither is Beverly,” I said, and straightened. Any protest Nathan might have been considering died when he saw the way I was holding the leash. He nodded. “Okay. I’ll be right there. I love you.” He kissed my cheek, and he was gone, speed walking toward the nearest set of doors. The nearest security guard frowned in my direction as soon as Nathan was out of sight. I was disheveled, and I was with a dog who didn’t have a service jacket on. I offered the woman a wavering smile and turned to walk quickly toward the nearest bank of elevators, hoping that she’d let me go off and become someone else’s problem. Luck, or maybe laziness, was with me; the guard kept glaring until I was safely in the elevator and bound for Nathan’s floor. Beverly walked easily on her leash, with none of the pulling or foot-dragging that I’d witnessed when she was being walked by her owner; she even heeled naturally, settling against my leg like she’d been born there. Beverly turned her big brown eyes on me and believed every word I said. I could see it in her face, and belief is in the nature of dogs. The unspoken Are you okay? in her words was loud enough that she might as well have said it. I mustered a smile and said, “A glass of water would be good.” A fainting couch would be better, but if I asked for that, I was going to find myself getting more medical attention than I wanted—and there was no telling what would happen to Beverly, who really wasn’t supposed to be in the hospital. “ ‘The goods’?” I echoed. “That’s what makes you a better person than your government masters.” Devi emerged with a bottle of red Gatorade. I wasn’t sure whether it was the red kind that supposedly tasted like fruit punch or the red kind that supposedly tasted like cherry. I also wasn’t sure it mattered. I was thirsty enough that the first half of the bottle didn’t taste like anything but sweetness. By the time the first traces of artificial fruit came creeping in, the dryness in my throat was mostly gone, and Devi was no longer watching me like she was afraid I’d keel over at any moment. The image of the man in the park—Beverly’s real master, even if she had abandoned him for me—as the animation drained from his face rose behind my eyes. My stomach gave a lurch, objecting to the memory more than to the Gatorade. The result was the same. I clapped a hand over my mouth, thrusting Beverly’s leash into Devi’s hands. Devi looked unsurprised. She took the leash and stepped aside, clearing the way for me to race to the bathroom. Red Gatorade looks a lot like blood when it’s filling a toilet basin. I stayed on my knees in front of the bowl, bracing my hands against the floor while I waited for my head to stop spinning. My stomach gave another lurch. I managed to flush away the mess before I threw up again, but barely. I shuddered. Then I straightened, dried my face with a paper towel, and walked back out of the bathroom to rescue Devi from Beverly. Devi turned out not to need much rescuing. She was back behind her desk, and Beverly was sprawled at her feet, looking like she belonged exactly where she was. I laughed a little, despite the ongoing lightness in my head. “Your sacrifice will not go overlooked,” I said. “Yes, Devi,” I said meekly. She was right about the dehydration: I was once again thirsty enough that the Gatorade didn’t taste of anything but sweetness. I finished the bottle without pausing. “Yes, Dr. Kim,” said Devi. She turned to her computer, fingers already starting to fly as she pulled up his calendar and began shooting off e-mails to the people affected by the change in Nathan’s plans for the day. Beverly smacked her tail once against the floor, as if to emphasize my statement. It made a dull slapping sound, and both of us looked toward the dog. She let her tongue loll, seemingly pleased by the attention. “I need you to get your things,” Nathan said. “No, keep doing what you’re doing. That’s more important than waiting on me.” He walked past me and Beverly, pausing to kiss my cheek and murmur, “I’m sorry. I should have realized that would frighten you,” before continuing on to the fridge. He returned with a bottle of electric orange Gatorade in his hand. “Fake orange or fake mango?” I asked. My voice didn’t quaver. I was oddly proud of myself for that. “She always says that just before she pries,” commented Nathan. Speaking of trust… I looked down into Beverly’s big brown eyes and decided, then and there, that no one I didn’t trust was going to take her away from me, whether or not they were related to her actual owner. Dogs get to pick their people. Beverly had picked me. If her owner didn’t recover, and she didn’t pick somebody else to take my place, we were going to stay together. The idea of getting into a car with someone whose driving history I didn’t know made my chest clench and my stomach turn over again. Sure, I did exactly that every time I took a bus, but there was something reassuringly solid about buses. Even after hearing about the bus driver with the sleeping sickness, buses felt safer to me than cars. Still, Nathan was needed, and Devi was already heading home. Mustering every inch of calm I could find, I nodded. “Sure,” I said. “That’ll be fine. Devi’s always been really nice to me, and won’t it be better for you to get down to the ER now, not after dealing with there-and-back traffic?” To punctuate my point I stepped forward, tugging on Beverly’s leash so she’d come with me, and kissed him lightly. He flushed, eyes darting toward Devi. “Okay,” said Nathan, looking relieved and guilty at the same time. I understood the combination. I was feeling something similar—relieved to be getting out of here, guilty to be leaving him alone—leavened with a healthy dose of fear. Looking into his eyes, I suspected that I wasn’t the only one who was scared. All that did was frighten me more. Devi’s car was a ’25 Prius, silver-beige, with no worrisome dents or signs that she’d been in a major accident. I relaxed a little. I relaxed more when she buckled her belt before putting her keys in her pocket and pressing the button to start the engine. She glanced my way, checking to be sure she wasn’t the only one who was buckled in. I offered a wan smile. The dog didn’t answer. I think both of us found that a little reassuring. Devi pressed the button to turn off the voice instructions and activate the LED readout on the windshield. That made me relax a little more. Drivers who see their directions are less likely to take their eyes off the road, and reading without the voice component had been shown to reduce accidents by as much as eight percent. I’d met Katherine once, at a hospital cocktail party that Nathan dragged me to. She worked at the Lawrence Hall of Science and always looked a little distracted, like she was listening to conversation and running some complicated equation in her head at the same time. She stood almost a full foot taller than Devi, with a pale Scandinavian complexion and a broad Minnesota accent, and from everything I could tell, the two of them were blissfully happy together. “We vacuum up a lot of feathers and buy a lot of throw pillows.” Devi’s car rode smoothly enough that I barely even noticed when she turned onto the freeway—not until a less safe driver went rocketing by on our left, going easily twenty miles above the speed limit. Some of the other drivers leaned on their horns. I grabbed the handle above my door and squinted my eyes tightly closed, trying to tell myself that I was hanging off the passenger grip on the bus, and that I wasn’t on the freeway. I was anywhere but there. “Everyone was concerned,” I said. My parents had been at the head of that particular line of anxious people, convinced that Nathan was taking advantage of me by getting into a relationship with someone who had only recently been wearing a soy-paper gown, even if he hadn’t known that when we met. We’d been able to bring them around, but it had taken time, and showing over and over that Nathan wasn’t just good for me, he was great for me. I liked to think that I was the same for him. “Absolutely.” I slid out of the car before opening the back door and taking hold of Beverly’s leash. She jumped obligingly down to the driveway. I closed both doors, waved to Devi one last time, and turned to walk up the path to the house. She was still there when I unlocked the front door and stepped inside, Beverly sticking close to my heels all the way. I turned to face the living room window and watched as Devi drove away. In a matter of seconds, she was gone, and the street was still. “Mom? Dad? Joyce?” No one answered. I was alone in the house. I had been expecting that; it wasn’t the middle of the day, exactly, more late afternoon at this point, but they all had jobs of their own to do. I was the only one who’d had the day off. It was actually a bit of a relief—I hadn’t been looking forward to explaining what I was doing home and where the dog had come from before I had the chance to calm down a little bit. I couldn’t say exactly what had been so disturbing about seeing Beverly’s owner get sick, any more than I could say exactly what it was about the sleepwalkers that disturbed me so much. Something about them was deeply and fundamentally wrong, in a way that I couldn’t articulate. I just knew that it made me feel like I was going to start throwing up again. Beverly sat at my feet, waiting to see what I was going to do next. I bent and unclipped her leash from her collar. Beverly stood, stretching luxuriously, and went trotting off into the living room. I shrugged out of my coat, hanging both it and the leash on the rack next to the door, and followed her. For the next ten minutes, Beverly explored the house and I followed her, watching as she sniffed at corners and shoved her head into places where I wouldn’t have expected it to fit. She was perfectly well behaved, not attempting to chew on anything or squat in any of the corners. Once she was done with the inside, I led her to the back door and opened it far enough for her to squeeze out and go to explore the backyard. I didn’t know whether we’d ever had a dog, but we had a high fence that looked like it would be sufficient to keep her from wandering off into traffic. I watched for a few minutes as Beverly explored the outside, her nose low to the ground and her tail carried high, like a rudder. Then I whistled for her to come inside. She bounded back through the sliding glass door into the kitchen, her tail wagging madly as I closed it behind. I needed to go to Safeway and get dog food for her. I needed to do a lot of things. I was suddenly too tired to stay on my feet. I staggered down the hall toward my room. I don’t remember getting into bed. I don’t remember falling asleep. All I remember is that one minute, the world was there, and the next minute, the world was gone. And, as always, I dreamt. Here in the hot warm dark, something is changing, something is different than it was before. There are words now, words here in the dark, words for things like “red” and “drums” and “time.” There is a “before” here now. There was never a before, and where there is a before, there can be an after. What is an “after”? I do not know, and because I do not know, because there is something to be known and an “I” to fail to know it, I am afraid. There isn’t supposed to be an after. There isn’t supposed to be an I. There’s only supposed to be the hot warm dark, forever, and it’s never supposed to change.